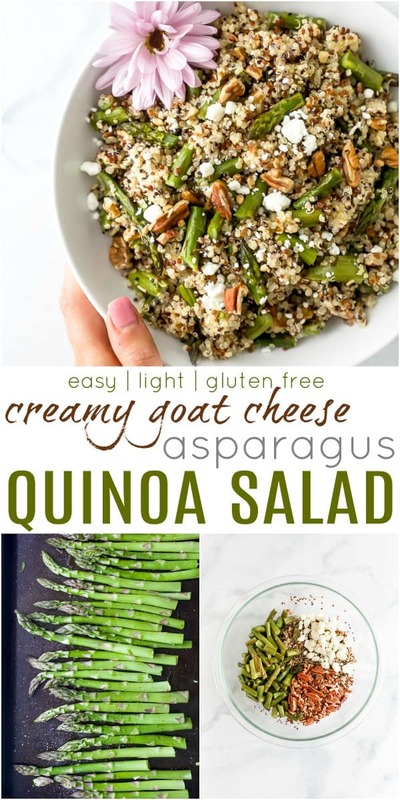 Healthy Goat Cheese Asparagus Quinoa Salad – another tasty quinoa recipe to add to your menu! 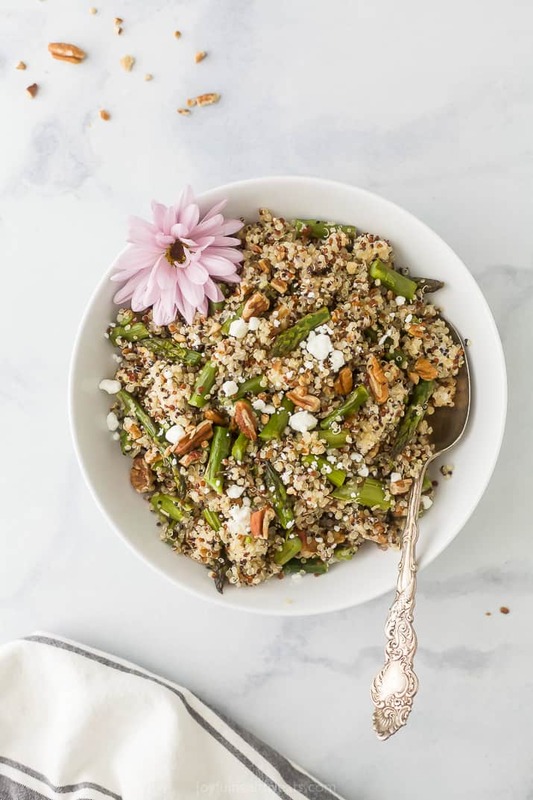 Hearty quinoa tossed with roasted asparagus, garlic and creamy goat cheese. 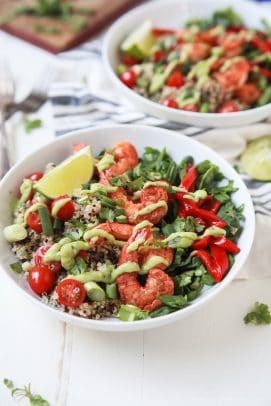 This quick easy gluten free salad is perfect for a simple lunch or side dish. The other day I was in desperate need of a pedicure. Like, we’re talking half of my nail polish was disappearing or chipped off of all my toes, AND the nail polish was red so it looked like I had some kind serious infection. Gross! My sweet husband told me, “just go get one. I’ll put little man down for bed.” (LoVE that man …) Even as I write this I am in a quiet house because he took little man out for a daddy son doughnut morning. Any who, back to the point. After we had finished dinner I went out to get a pedicure and fix the mess that were my nails. While I was there a mom and a young daughter walk in (I would say she was about 11 years old). I smiled because it reminded me of my mom. As they got situated and told their nail ladies what color they wanted they both leaned back, got comfy and pulled out their phones. The entire time the mom was scrolling through her phone and her daughter was listening to music, text messaging, or watching a show. The only time they talked was when the mom leaned over to “check on her” to say “what are you watching?” That time could have been special … a mother daughter pedicure date .. but instead the phone came between them. Instead of talking to each other they sat their in silence, eyes glued to the glowing screen. My heart just hurt. Why are we so pulled to this small 3×3 device called a phone. Why can we not set it down for 45 minutes to engage and invest in people we love… or relax when we are suppose to relax. All in all, I guess I just wanted to say. What does your “phone life” look like? Are you on it all the time? Are you on your phone for a purpose or is it just to waste time? What about your kids? Quinoa Salad is just that. A salad with a base of quinoa instead of lettuce. It will typically have lots of vegetables in it, sometimes a protein and a dressing. Quinoa Salad can be served both warm and cold. It honestly just depends on the kind of salad you’re making. 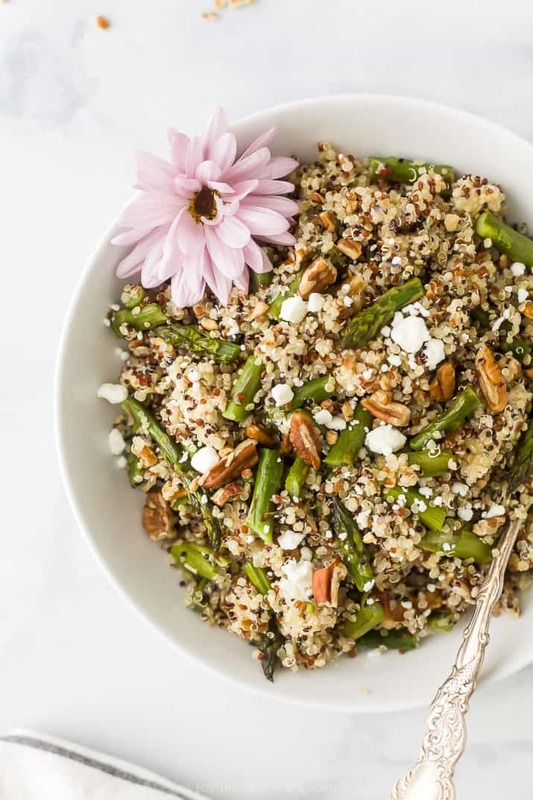 This Asparagus Quinoa Salad is best served warm, but my Crunchy Thai Quinoa Salad is best cold. 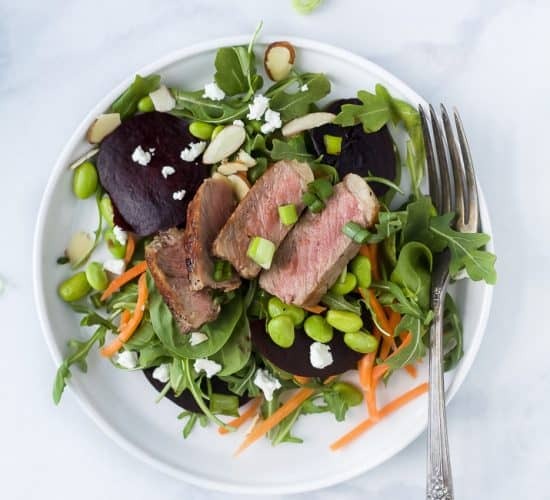 Just take a look at your ingredients and if they are “raw” veggies than you’ll probably want the salad cold. 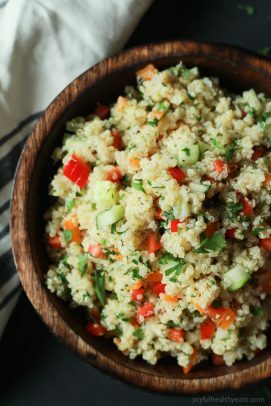 Store your quinoa salad in an air tight container in the refrigerator. If stored properly, this salad will last 3-5 days. 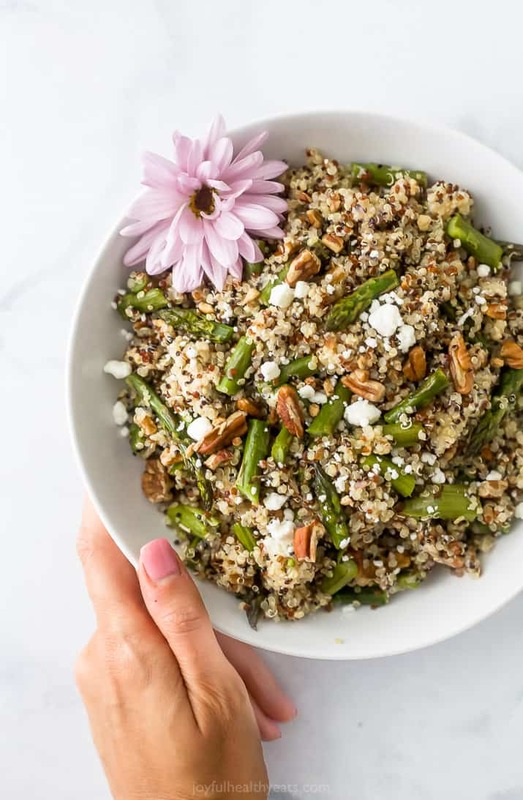 This Quinoa Salad is packed with sweet roasted Asparagus, chopped Pecans, and creamy Goat Cheese. Because the Quinoa is warm when I put this together the goat cheese melted into everything and OMG was it good! 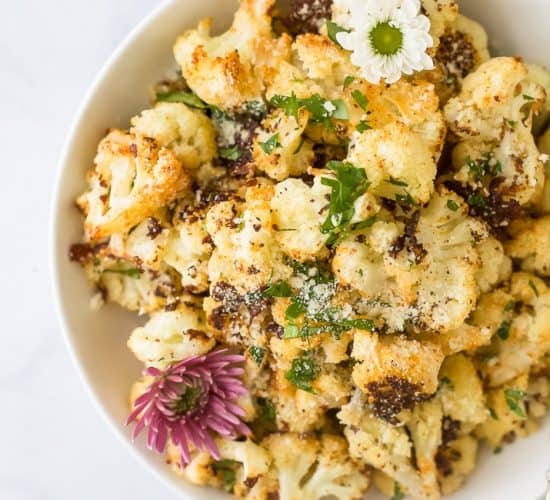 If you’re in need of a quick, healthy, gluten free, and even vegetarian side dish .. ahem.. you’re looking at it! 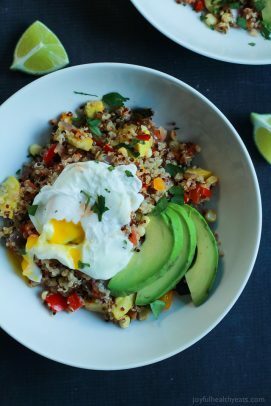 Quinoa is loaded with nutrients! 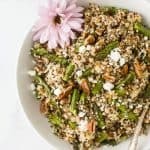 This Creamy Goat Cheese Asparagus Quinoa Salad (whew, say that three times) takes 25 minutes to make, is under 150 calories a serving, and has a good amount of protein in it to go along side your main protein. Can’t wait to hear what you think, Bon Appetit my friends! What to eat Quinoa Salad with? 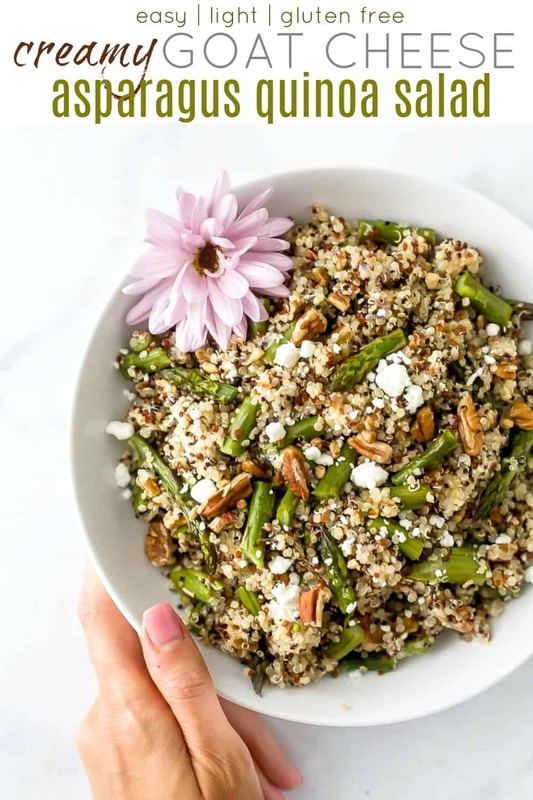 Healthy Goat Cheese Asparagus Quinoa Salad – another tasty quinoa recipe to add to your menu! 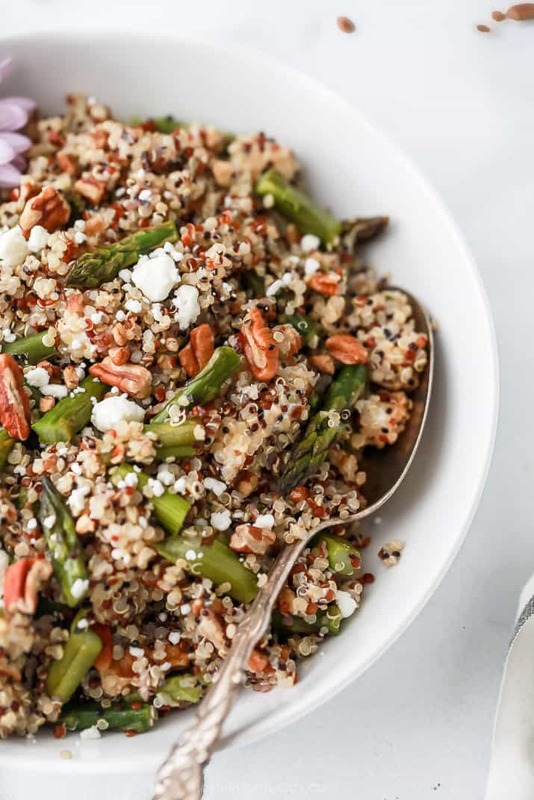 Hearty quinoa tossed with roasted asparagus, garlic and creamy goat cheese. 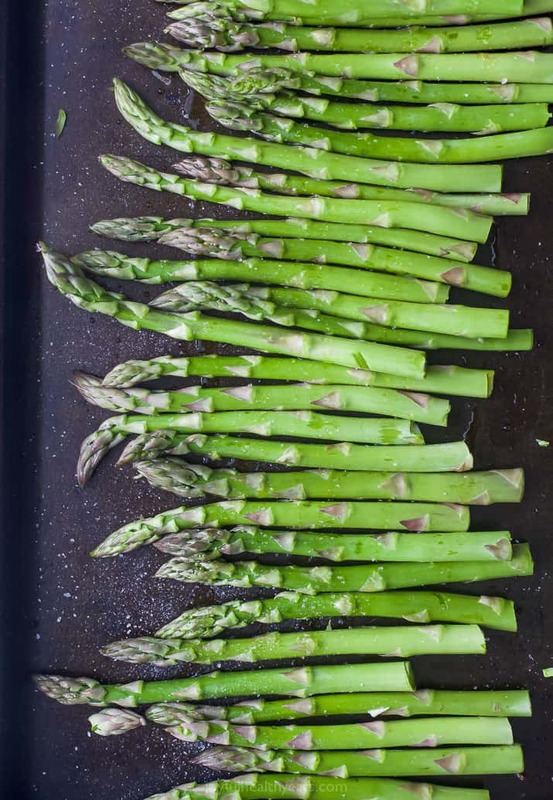 Add asparagus to a baking sheet. Drizzle 1 tablespoon olive oil and 1/4 teaspoon of sea salt over asparagus. Toss to coat the asparagus then lay them out in a single layer on the baking sheet. Bake for 20 minutes. Remove from oven and cut into 1/2″ slices. Set aside. In a medium saucepan add quinoa and water. Bring the water to a boil. Once boiling reduce the heat to a simmer and cover. Cook for 15 minutes or until liquid is evaporated. Once the quinoa is done, fluff with a fork. 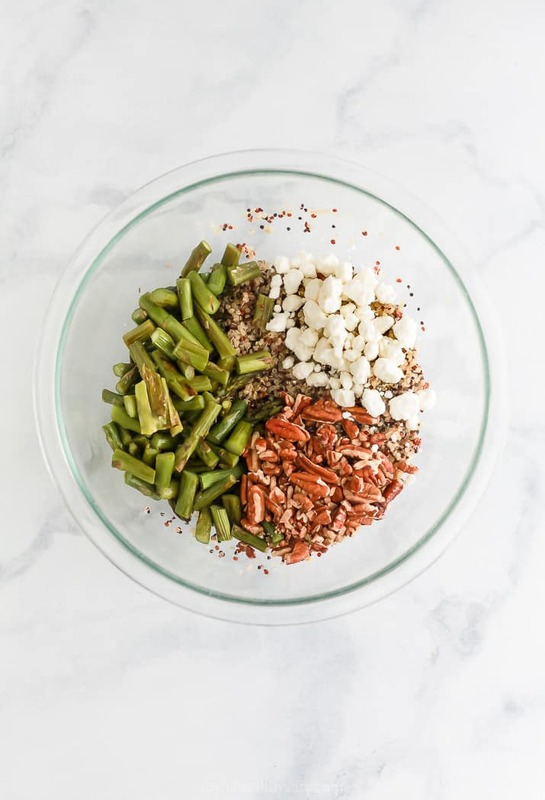 Add quinoa to a medium bowl along with chopped asparagus, pecans, goat cheese, red wine vinegar, olive oil, garlic powder, and salt to season. Toss everything together and serve! Wow, what a great post!! Being on my phone is sometimes hard to remember to stay mindful about, but I try really hard to stay off my phone while I’m out with friends, at dinner, or with my boyfriend. I want them to know I value their time and what they say… nothing is more disheartening then having a conversation with a friend only to look over and see they are glued to their phone. Thanks Samantha, hope you enjoy this salad! 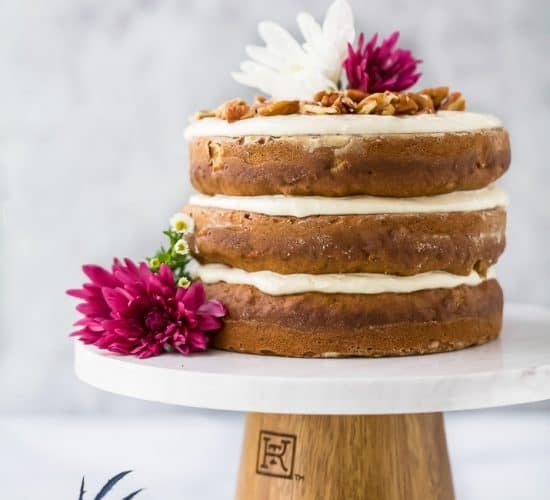 OMG, this recipe looks fabulous! I can’t wait to try it! Thanks for posting it! This salad and a glass of Pinot Grigio! I could have a meal with my husband and what ever children decide to show up! Yummy! I’m allergic to walnuts what you suggest a different but to add or what it be ok without any? 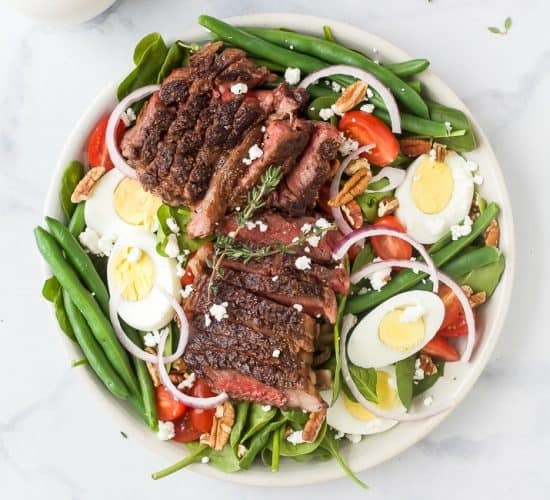 Easy and Healthy Recipes (that are also delicious!) – New Era of Sarah! Hi! For leftovers do you just leave out the goat cheese and add it each time you take a serving? Also do you serve it warm or cold? Thanks! I made this for Thanksgiving. It went over well!! I added craisins for something sweet. Ohh yummy! Love that cranberry addition! My wife made this last night. We didn’t have tri-color quinoa so she used white. One of the best things I’ve eaten in forever. Seriously delicious. The pecans and goat cheese go perfectly together. Awesome! So glad to hear it Daryl, it’s one of our favorites too! 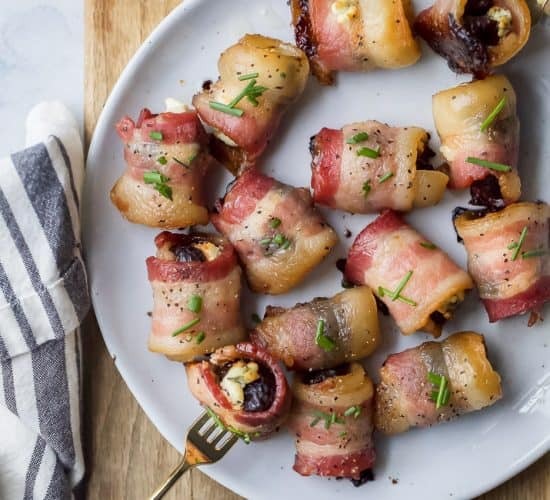 Hi,,,,so looking forward to trying this recipe. Picked up all the ingredients but forgot the goat cheese… do you think feta would be ok? Made this for Easter lunch. So yummy. Love goat cheese! Do you really roast the asparagus for 20 min.? I only do 8 min. For a side. Is it mushy then? I did prefer it to be crunchy. No, they get crunchy and browned. It’s delicious! No mushy asparagus here! I loved this salad! The flavors were great. I toasted the pecans, but probably chopped them too small, because they didn’t have a lot of crunch. I doubled the dressing. I also wasn’t brave enough to roast my thin asparagus 20 mins (did 12 mins), but I might try it next time. Leftover reheated (gently) very well. Will absolutely make again. Thanks! The links for sharing to the left of your page over shadow the ingredients list when using the print feature. I hope you can fix that. The recipe looks like a winner.